Jeepers peepers? Oh, there are "peepers" alright. Shia LaBeouf plays Kale Brecht, a sullen teenage boy who punches Senor Gutierrez, his high school Spanish teacher, in the nose. Problema grande as Kale is placed under house arrest for this classroom indiscretion. With an electronic device chained to his ankle poor old Kale is unable to venture further than 100 feet outside his home before automatically summoning the police. What's a fellow to do? Bushnell to the resuce. To pass the time away Kale spies on his neighbors, especially the new girl in town. Sarah Roemer is cast as Ashley Carlson and her drum-tight belly calls out for Ludwig to be stenciled on it. She's a fetching find, that's for sure, and no one can fault Kale for putting his trusty binoculars to use when slinky Ashley is swimming under the sunny suburban sky. On occasion Kale's best friend, Ronnie, comes over to take a longing peek as well. Going from window to window Kale declares their voyeurism as being "reality without the TV." Kale slowly becomes convinced that another neighbor, Mr. Turner, is a well-publicized serial killer. 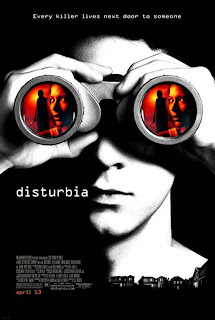 As the tag line for DISTURBIA states, "Every killer lives next door to someone." Kale believes he is the "someone" in this case and he slowly convinces Ronnie and Sarah of his suspicions. A round-the-clock surveillance ensues and there are more peeps taking place than at a Tyson hatchery. But who is watching who? David Morse plays Mr. Turner in a role that almost demands Anthony Hopkins -- especially when one considers the final act which becomes more than reminiscent of SILENCE OF THE LAMBS. At best, he's Hopkins Lite -- Morse's menace quotient being only slightly higher than that Dennis fellow. Director D. J. Caruso might just as well have cast Wally Cox, the original Mr. Peepers. As for the "jeepers" -- lets just say they are few and far between. Accordingly, the target audience -- teenage boys and their dates -- have plenty of time to cop a feel (or more) without missing a thing. Watching DISTURBIA I found myself reminiscing about those hormone-driven days when this New Braunfels Unicorn descended upon the local bijou with date in hand. Fond (and fondling) memories aside, DISTURBIA isn't the worst film released this year, but it sure doesn't hold a candle to the now-classic offerings by James H. Nicholson and Samuel Z. Arkoff -- THE HOUSE OF USHER, for instance. As Senor Gutierrez might say, "Eso fue una pelicula espantosa!"